Close-up of a Cracker Barrel sign on the outside of a restaurant. 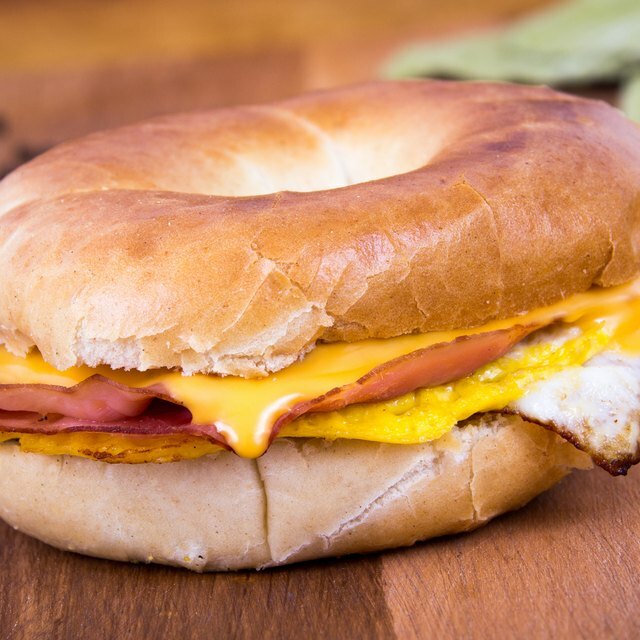 1 How Many Calories Are in a McDonald's Steak, Egg and Cheese Bagel? Cracker Barrel's mission is "pleasing people," and with more than 580 locations spread over 41 states, many folks have stopped in to sample their classic southern house specialties such as chicken 'n dumplings, chicken fried chicken, or biscuits 'n gravy with bacon or sausage. Cracker Barrel does not publish its recipes or give nutritional information, but does offer suggestions for health-conscious patrons. Classic southern dishes, including eggs, bacon, sausage, hickory smoked ham, buttermilk biscuits, gravy, grits, hash-brown casserole and fried apples are offered for breakfast all day at Cracker Barrel. Although the exact recipes used are closely guarded secrets, a fried egg generally has 90 calories, 7 g of fat and 210 mg of cholesterol, which is 70 percent of the RDA. A piece of bacon has 40 calories, 3 g of fat and 3 g of protein. The average buttermilk biscuit is 130 calories, has 6 g of fat and 15 percent of the RDA of sodium. 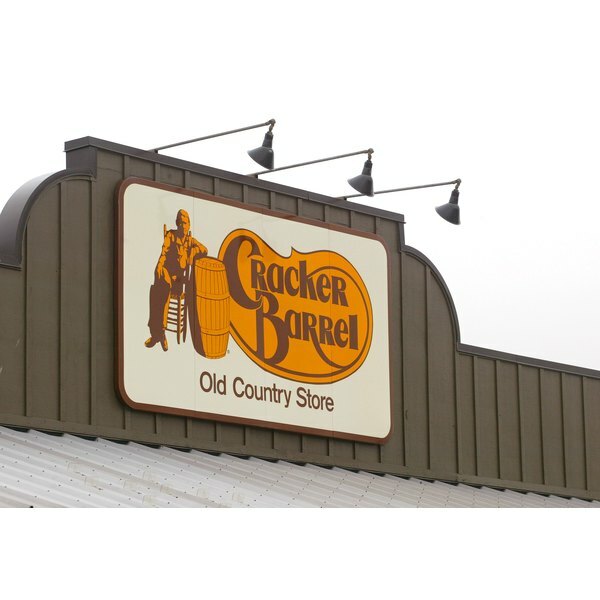 Cracker Barrel recommends these substitutions to help patrons make healthier breakfast choices: turkey sausage rather than pork sausage; EggBeaters, available at no extra charge, in place of eggs; whole grain cereals, including oatmeal, can be substituted for grits; skim milk and sugar-free pancake syrup are also available. Chicken fried chicken is a breast of chicken that is breaded, deep-fried and covered in gravy. Country fried steak, a Cracker Barrel specialty, is similar, but starts with beef instead of chicken. They also offer country fried shrimp, but that dish isn't served with gravy. Chicken fried steak with gravy at a competing restaurant is almost 550 calories, more than half of them coming from fat. There is also more than 1700 mg of sodium, more than the American Heart Association recommends for an entire day. Grilled chicken or fish are available as substitutes for the country dinners, which come with choice of three sides and a buttermilk biscuit or corn muffin. Cracker Barrel offers three types of salads -- the chicken tenderloin salad, the country chef salad and the homemade chicken salad. The chicken tenderloin salad includes your choice of grilled or fried chicken, hard-boiled egg, shredded cheese, a wedge of Colby cheese, greens, tomatoes and sourdough croutons. The chicken, eggs and two types of cheese add up to a lot of saturated fat, even more so if you choose fried chicken rather than grilled. The country chef salad is no better in the saturated fat category, as it contains turkey, ham, bacon, eggs and cheese. Cracker Barrel does offer several fat-free types of salad dressings, including Italian, ranch, honey mustard and thousand island. Over-sized sandwiches are served with soup or steak fries. Lighter choices include the oven roasted turkey breast or the homemade chicken salad. Avoid adding extra calories with cheese and condiments. Each slice of American cheese adds about 100 calories, and a tablespoon of mayonnaise adds 60 calories, almost all from fat. Less healthy choices include the fried chicken sandwich and pork BBQ, which could contain up to 100 calories per ounce and is very high in saturated fats. Cracker Barrel offers freshly brewed iced tea, either sweetened or unsweetened. It's a good idea to order the unsweetened tea and add sugar yourself, to be able to control the amount used. One teaspoon of sugar contains about 30 calories. Old fashioned lemonade, raspberry lemonade and raspberry iced tea are all pre-sweetened. If you don't want to stick with water, there are coffee, decaf, hot tea and diet sodas available. You may choose to end your meal with a traditional southern dessert favorite, including apple pie, apple dumplin', fruit cobblers, sundaes or plain ice cream. No sugar added apple pie and no sugar added vanilla ice cream have been added to the dessert menu, but a cup of fresh fruit from the breakfast menu would be a better option. Remember that "no sugar added" doesn't mean sugar-free, calorie-free or fat-free. There are naturally occurring sugars in dairy products, and 1/2 cup serving of no sugar added vanilla ice cream from the grocery store has 5 g of sugar and 80 calories.